Another edition of mlb.com beat reporter Bill Ladson‘s inbox, dated 1/9/12. Q: Will I be able to watch Bryce Harper in Syracuse this year, or will I have to drive to D.C.? Q: Will there be a battle for the fifth spot now that Brad Peacock and Tom Milone are gone, or is the job Ross Detwiler’s to lose? A: This is another question that keeps getting asked that I don’t get: John Lannan has been an underrated innings eater for this team for years and was tendered a contract for 2012. He’s GOING to be in the rotation. People who think for some reason there’s a rotation competition brewing in spring training are foolish; this team has 5 starters under contract, some for significant dollars or investment, and there’s just no room (barring injury) for anyone else. Detwiler was the 5th starter favorite until the moment we acquired Gonzalez. Now he’s clearly either trade bait or a long-man out of the pen. Ladson still thinks there’s a rotation competition in spring training. I think he’s nuts. Technically Lannan has an option and could go down to make room for Detwiler … but do you want to have a $4.9M (his arbitration estimate at mlbtraderumors.com) pitcher in Syracuse?? Q: I’m not sure how you came up with [only] 85 [projected] wins [for the team in 2012] without Prince Fielder. The Nationals won 80 games last year and will have Strasburg for almost a full season, Zimmermann and adding Gio Gonzalez helps. Looking at last year’s rotation, how does that not add up to a 90-plus-win season and a Wild Card birth? A: I think my initial win guess for 2012 was in the 85-88 games category. On the face of it, this team should be 10 games improved easily. But something always happens; you lose a key player to injury, someone under performs, etc. So you can’t take the best case scenario all the time. Ladson says the offense needs to improve to get > 85 wins. Clearly. Q: I like Prince Fielder, but he doesn’t seem right for the Nats. 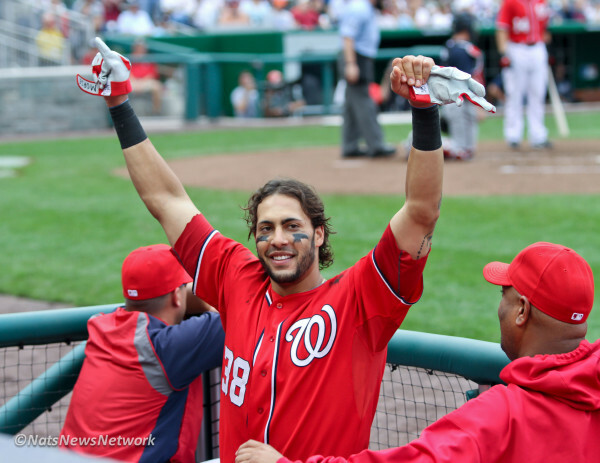 He can’t be a designated hitter in the National League, and tying up first base interferes with long-term plans for Michael Morse and perhaps even Zimmerman. Why is Fielder being linked to the Nats? A: Its like deja vu; we’re answering the same questions over and over. 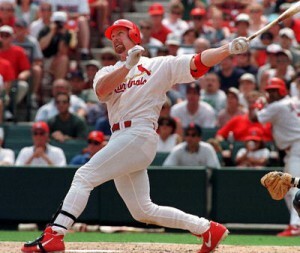 Small sentence answers: You don’t need to have a plus-plus defender at 1B; you need a hitter. Why are we worried about where our gold-glove Third Baseman will be playing in 10 years time when he’s finally moving away from 3b? Brooks Robinson played 144 games and won a gold glove (the last of his 16 consecutive awards) when he was 38. Morse? Lets find out if he’s more than a one-year wonder before talking about needing to clear room for him to play for the next 5 years as well. Ladson points out that the rumors fly because Boras works well with the Nats. Lots will clear up in the next couple of weeks. Q: How about Raul Ibanez coming off the bench on a one-year deal? He can play one of the corner outfield spots, be a big bat off the bench and help Jayson Werth teach the game to Washington’s young outfielders. A: Ibanez was washed up last year, both offensively and defensively. There are better alternatives. Ladson agrees, but notes he’s been wrong before about the capabilities of bats off the bench. 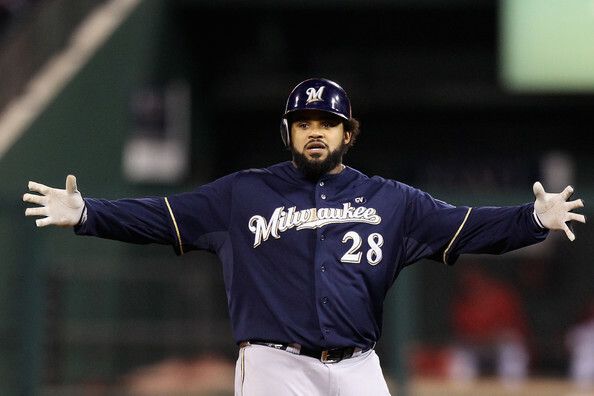 At this point, what *really* is the Fielder FA market? Unless you’ve been living under a rock, you know by now that Prince Fielder is looking for a 9 figure contract, that there doesn’t seem to be a lot of suitors for him, and that he keeps being linked to the Washington Nationals, despite sources saying we’re not interested. 1. Teams that have long-term, major money commitments to established 1B stars, right now. Colorado: Todd Helton (not that he’s a major committment, but he did just re-sign thru 2013). You could quibble with the selection of Miami as not being in the market; after all they were throwing money at Pujols and have committed something in the range of $165M in heavily back-loaded contracts already this off-season. But I havn’t read a single sentence indicating any interest with Fielder. You could slightly quibble with Colorado, but if so I’ll say that Colorado also falls into one of the “No” categories below. Read on. Baltimore. That’s it. Anyone that signs in Baltimore is essentially saying, “I want to play for the worst organization in baseball and guarantee myself 5th place finishes for the entirety of my contract.” Who would possibly go to play there unless they’re a lower-tier FA who wants to guarantee himself a starting job? Such a shame; this was the highest payroll team in the game in the mid 90s. We talk about how Bud Selig needs to take away the Mets … how about forcing Angelos to sell this former jewel franchise to someone who actually wants to see them win? Obviously the situation with the Dodgers and Mets prevents them from doing such a franchise-altering commitment. Plus both teams have half-way decent options playing at 1B for them now (James Loney and Ike Davis). The Giants were at $118M in 2011 and seem tapped out; they have $84M committed prior to their Arb cases, including a potentially record-setting arbitration case with Tim Lincecum. They’ll easily be above $100M once these cases are said and done. 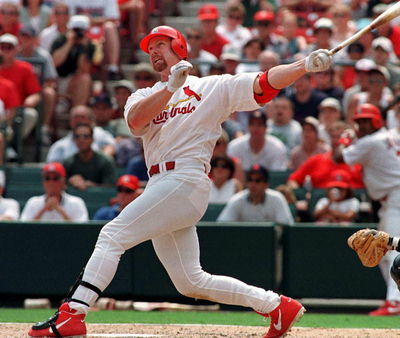 Lastly St. Louis: if they were willing to pay $25M/year, they would have re-signed Pujols. So clearly they’ve reached a financial threshold themselves. I’d also put Colorado in this category; they aren’t exactly a small-market team but they also don’t seem like they’re in the mood to increase payroll $25M/year. Both these teams should be obvious just by their mention. Oakland is going to try to field a $20M payroll team, and Houston has bottomed out and clearly is starting over. Chicago Cubs (Anthony Rizzo): probably more in the “rebuilding mode” category; Epstein likes Rizzo, just re-acquired him and I’d be shocked if they blocked him by getting Fielder. Most of these teams could fit into multiple categories. Lots of rumors out there saying that Seattle is a natural landing spot for Fielder but I don’t see it: Smoak is the reason Seattle agreed to trade Cliff Lee, and you don’t just give up on guys like that. Meanwhile Seattle is now miles behind their divisional rivals and may not compete for a decade. Why would Fielder go there? Meanwhile, the Cubs seem like an interesting case. NL team, NL central team, storied name. But they didn’t hire Theo Epstein to just make the leap; their ownership clearly realized that their franchise was on the downside both at the MLB level and in the farm system. Bad contracts, bad clubhouse. They’re rebuilding for a renewed run in a few year’s time. All these teams seem to be pretty self-explanatory. Maybe Arizona gets into the market, but they’ve gone to great pains to lose payroll, paring it down to just $56M last year while somehow winning the division. Their highest paid player in 2011 was just $5.8M. A $25M/year guy doesn’t fit with their team. Pro Texas: they are getting a massive amount of money influx in. They may or may not win the Yu Darvish sweepstakes, meaning they may or may not have an “extra” $120M or so sitting around in a couple weeks. Moreland isn’t exactly lighting the world on fire and wouldn’t be an impediment. Con Texas: They don’t NEED more offense; they’ve bashed their way to two consecutive AL pennants by having an offense ranked in the top 3 in pretty much every category. They had a guy who hit 29 homers batting 7th for them in the off-season (Nelson Cruz). Pro Toronto: they have payroll room. 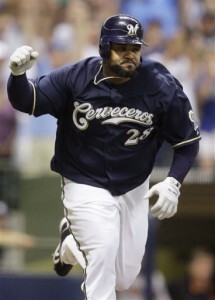 They can let Fielder DH some of the time. They have a good young pitching staff they can build on. Lind hit 26 homers but isn’t blocking them from acquiring someone better. They do need to improve their offense and he’d fit naturally behind Jose Bautista, giving him even better pitches to turn on. Con Toronto: they’re the 4th best team in the AL East and havn’t made the playoffs since the Wild Card era. What makes you think they’re going to catch the 3 teams above them, no matter how much they spend? 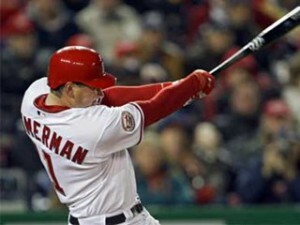 This has to come into Fielder’s thought process, doesn’t it? They also don’t have the pitching right now to really compete in the AL East, having traded away their main studs for prospects in recent years. 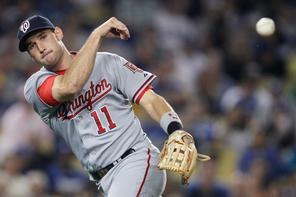 Pro Washington: This team needs offense; we’ve declined in runs scored 3 years running. Plain and simple. 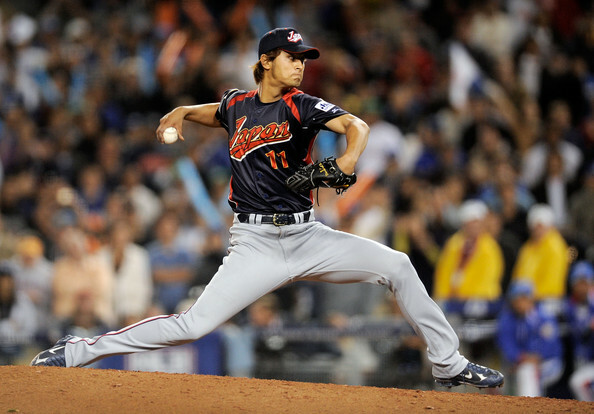 In the end though, if Texas signs Darvish I’d think they’d be out of the running. And Toronto hasn’t really shown an inclination to spend Fielder kinds of money, and seem more in a rebuilding phase than a “go for it now” phase. Which means the Fielder market may be …. just Washington. What do you think? Are there any teams besides Texas, Toronto and the Nats that are *really* in the conversation? Or is Boras negotiating against himself right now? What are non-MLB associated baseball league talent equivalents? Editor’s Note: this post was originally published in January of 2012: I have updated it as I have received new information several times since. But some of the information and statements may be dated based on when it was initially written (like the Yu Darvish comment in the intro). Over the years I’ve also added in more leagues and more details on existing leagues, including Wood bat leagues and Independent leagues. I’ve always wondered, since we hear so much about players’ tearing up winter leagues or hear wonderful stat lines from players coming over from foreign countries (as we are now in the Yu Darvish mania). So what is the talent-equivalent of the various leagues outside of the conventional MLB-AAA-AA-A-rookie levels? I did a bit of digging around, asking questions and came up with the following approximations. Feel free to debate if you think otherwise. Japan: the Nippon Professional Baseball League rates, by various accounts, as a mid AAA-level talent league. Baseball Prospectus’ Clay Davenport did a stat-heavy analysis in 2002 and concluded that the NPB was at least AAA level, perhaps close to MLB level. However, the prevalence of mediocre players from the US going to Japan and being super-stars seems to indicate that Japan is no better than AAA, and may be a bit weaker. And, not to claim this is about talent levels per race, but there have only been a very small number of Japanese-born players who were really impact players upon arriving here. Cuba: per Dave Cameron (mentioned in a chat, need the link) the “general consensus” is that the Cuban pro league is about a High-A level of talent. I wonder if it isn’t higher though, given the immediate impact that a number of Cuban ex-patriots have had immediately upon their arrival in the US (Yasiel Puig, Jose Abreu being exhibits 1 and 1-a). I wonder if this will start rising now that the embargo has eased and the Cuban government has begun allowing its players to legally play elsewhere. Taiwan/China: Taiwan had its own thriving baseball league for a bit, but merged it into the main Chinese league in 2003. Given the small numbers of Taiwanese-born players who have made it to the majors, and the fact that the league serves mostly as a feeder into the Japanese league, its safe to say that the Chinese league is no better than a high-A level of talent. Korea: As with the Chinese leagues, Korea mostly feeds into the Japanese league. High-A talent levels. Might be on the rise though, as more and more 4-A/AAA veterans decamp for Korea instead of Japan. That may be driven more by money than by competition though. European Leagues: Believe it or not, there are thriving baseball leagues all throughout Europe. They even have multiple levels of play in certain countries (the Netherlands in particular). However, based on the levels of talent of players that typically play in Europe, its hard to put the talent levels at anything close to our own Rookie leagues. In fact, I’d suspect that most European pro teams are no better than a low division 1 college baseball program (such as GW or Catholic U’s teams). Mexican Summer League: listed as a AAA-quality league in places like Baseball-Reference, but studies have shown it isn’t anywhere close. A-level talent. Leagues elsewhere: there’s leagues just about every where else; wikipedia searches turn up baseball leagues in Australia, Asia, the far pacific. I didn’t do any research here, assuming that these leagues are one slight notch above amateur leagues in the US. Davenport also did a bit of analysis on the various winter leagues in 2004; I’ve taken his recommendations and adjusted them based roughly on observation over the past few years, since the winter leagues have been shifting in terms of talent attracted in recent years. Players looking to get in additional work after an injury-filled year curtailed their seasons. Players looking to work on a new pitch, a new swing or some other experimental part of their game. So, the talent levels in these various leagues are usually all over the road. Dominican Winter League: Seemingly the “best” winter league, having the most ex-patriots playing in the US. Davenport’s studies from earlier in the decade showed that the talent level is roughly equivalent to AAA talent, an opinion that I still maintain. 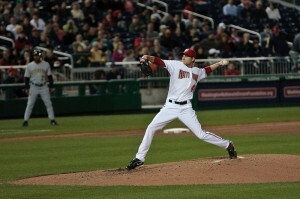 Our own Yunesky Maya tore up the DWL last winter, but struggled to be just a serviceable pitcher in Syracuse all year. Puerto Rico Winter League : seems to be the 2nd strongest Winter League, but with slightly fewer MLBers than in the DWL. So we’ll call it AAA level, but weaker. Venezuela Winter League: The talent levels have dropped for a while, ever since political turmoil has taken over the country. This is highlighted especially close to home in 2011 with the Wilson Ramos kidnapping case. However, Nats farmhand Ryan Tatusko was kind enough to provide his opinion on the talent level and calls it “AAA talent.” I think at best its a low AAA, as the league is clearly lower quality than Puerto Rico. This last season’s version of the VWL seemed to be more talented that past versions though; perhaps this league is looking to challenge the DWL for pre-eminence in the winter leagues. Mexican Winter League: Its really hard to tell; the winter leagues are quite a bit better than the summer league, at least per Davenport’s studies. Now? I’d guess the MWL has degraded a bit and is probably on a par with Venezuela in terms of talent. AA-level at best. Arizona Fall League: the AFL rates somewhere between a AA and AAA level by and large, though for several reasons it rates as a very heavy hitter-league (pitcher workloads and ball-parks mostly). Most of your pro teams send their top prospects from levels below AA and a number of AA and AAA (and even some guys who have MLB experience). All told, that equates with a “good” AA league. 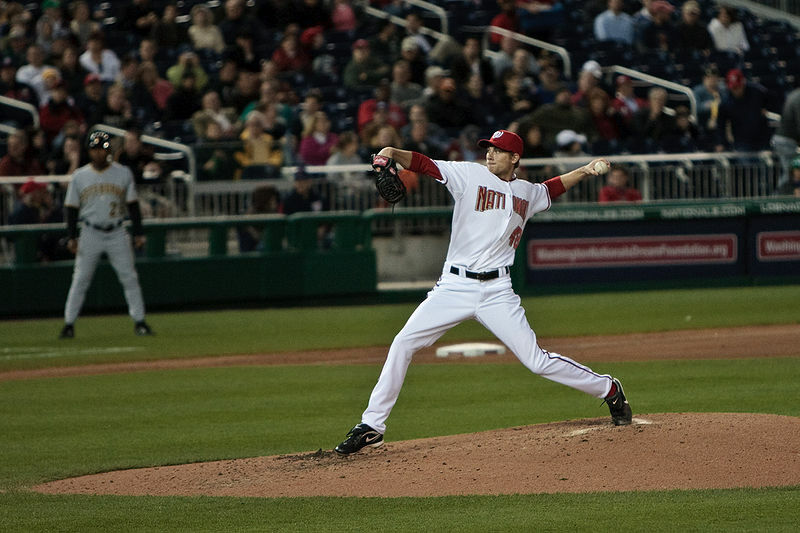 And since AA leagues are morphing into being populated with a team’s best prospects while AAA leagues are becoming repositories for “spare parts” for the MLB team, more and more the lines are blurred between AAA and AA in terms of “which team could really beat the other.” Nationals fans saw this pretty clearly during Stephen Strasburg‘s minor league career; he was hit in AA but absolutely dominated AAA teams that seemed to be populated with backup catchers and backup infielders. Regular NCAA Division I College Teams are probably not even as good as a Rookie league team, when balancing the entirety of the roster’s depth. I had this debate with my father recently, noting that the best Div-1 team in one recent year (South Carolina) was led by a pitcher (Mike Roth) who was a 31st round draft pick in 2011. College teams only have 11.7 scholarships to use to field a team. A good chunk of college teams are guys on partial scholarships or are complete walk-ons. Good college teams may each have a number of pro prospects, but usually only 1 or 2 legitimate prospects. On the flip side, even a rookie-level team is ENTIRELY comprised of players who were drafted, and will include high school players who signed in lieu of going to college because they were considered good enough at the time to risk signing. A college team may use a hot pitcher to beat a pro team in a theoretical 3-game series every once in a while, but a team full of professional hitters are eventually going to utterly dominate typical college bullpens, Sunday starters and mid-week players. Top end NCAA Division 1 College Teams, as in teams that are populated with a ton of future Pro talent, are likely the equivalent of the Advanced Short season Short-A leagues like the NY Penn league. The absolute best Div-1 teams (like a friday night match-up between nationally ranked SEC teams) may broach the equivalent of low-A teams, as discussed in this 2015 Kiley McDaniel chat here. When a college junior is highly drafted, most scouts advise that they go to at least high-A as a first stop, often saying that they’d be wasting their time in Low-A. Does this imply that high-end Division 1 teams are more the equivalent of Low-A teams? It seems so, at least at the upper cream of the crop level. Consider the talent level on the 2014-2015 Vanderbilt team with multiple first round picks, or the 2018 Florida/Oregone State teams (each of which had 3 first rounders); I’d guess that team on a whole could easily compete with some short-league teams comprised mostly of 20th and 30th round college draftees and perhaps higher. (Post publishing update May 2016: this question came up in quora.com and LA Dodger’s pitcher Brandon McCarthy provided a great answer not to terribly different from mine here. He thinks the best Div-1 teams would have a chance in a 7-game series against a low-A team, but would probably fall short due to pitching depth. Juco, Division II, Division III: Generally speaking a notch below the low-end Division I teams for obvious reasons. Perhaps you could make an exception for some of the higher-end Juco leagues out there (like the league that Bryce Harper played in for one year to establish draft eligibility) and claim they’re of a low-division I quality, but that might be a stretch in the grand scheme of things. So if these leagues aren’t even as strong as a low Division I team, they’re not even close to a pro-level quality. (Post-publishing update Apr 2016); read the excellent commentary from former Juco player James Pidutti, who gives some great context for the wide variety of talent in the Juco ranks these days). We have a thriving college wood bat league industry going on, with college players scattering all over the continent to play summer league baseball with wood bats. Some of these leagues are better than others; you can write a whole analysis just to try to rank the leagues (in fact, I have, but I’ve yet to publish it because I’m not sure I have it exactly right), so I’ll just use general groupings to try to rank these leagues. Cape Cod League: By far the most dominant wood bat league. These teams are basically Division I all star teams of players, and the numbers speak for themselves. 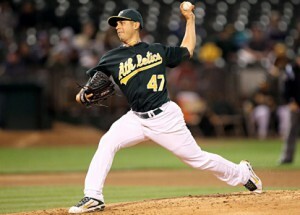 1100 alumni have played in the majors (about one out of every seven current major leaguers). More than half of the first round draftees last year were Cape Cod players. They are the self-proclaimed “greatest amateur league in the world” and there’s no argument. So how would a Cape Cod team fare when stacked up against a pro league? I’d put these a step above the best division 1 teams and say these are High-A equivalent teams. Northwoods League: After a step down from Cape Cod is Northwoods, who just had their 141st alumni debut in the majors. The calibre of players is significantly lower than in the Cape: a quick gander at the rosters for 2015 found just a handful of players from “power conference” teams on each roster. So I’m putting these teams at the same level as a “run of the mill” Division I team, or below a Rookie League team. The next tier of collegiate leagues, including Coastal Plains, New England Collegiate, West Coast, California Collegiate and the Alaska League: less talent than in Northwoods and thus even further away from any pro level. There are many more college leagues not mentioned here that probably rate as having even less talent than the already named leagues. That includes our local leagues the Cal Ripken League and the Valley League. I’m guessing that when the old Class-B/Class-C/Class-D leagues died out in the 50s, those players then began percolating into what we now see as an improved and thriving College baseball industry, Semi-Pro leagues scattered around the country, and the (now) official Indy league designation. I always attribute the death of these low-class leagues to the advent of Television, which replaced the (usually) one source of nightly entertainment for small towns across America, which before the mid 50s would have been baseball. Here in the DC area, there’s a “semi pro” league that is the combination of two long-standing leagues (the “Industrial League” and the “Credit Union” league) that features very good baseball. Ex division-1 players, ex Pros, good baseball. Back in the 50s this probably was a class-D level league (assuming that class-B was what has become the rookie leagues and class-C has morphed into the Independent leagues). Here’s a table summarizing the above data, along with some clarifications from the comments after-the-fact, in order of best to least quality. (Note; the cut-n-paste below is from 2012; see the descriptions above for some updates to league talents…). Do you agree/disagree with these ratings? Please feel free to comment and discuss.